Albany is putting more money into helping Niagara Falls continue to improve its sewer plant, to prevent a re-run of the "black water" overflow image carried by media outlets around the world in July of last year. The black water and its accompanying odor in July of last year exposed serious problems with the Niagara Falls Water Board and its operations. Since then, the agency agreed with the New York State Department of Environmental Conservation on a massive series of changes. In turn, Albany put $20 million into resolving the primary problems, including repairs to a pump station in the Niagara Gorge. Niagara Falls Mayor Paul Dyster said the pump serves the city's north end. The black water that went viral. "So the whole northern end of the city drains to a location in the Niagara River Gorge from which water is then pumped uphill to the Wasterwater Treatment Plant, Dyster said, "and when there is a failure at the gorge pump station, of course, that means that stormwater, but including also combined sewer effluent, from the northern end of the city is washed right into the Niagara River Gorge." Now, Albany is putting up half the $27 million cost of continuing major repairs and improvements to the treatment plant on Buffalo Avenue. "Is this going to guarantee there will never be a combined sewer overflow at the plant? No, not yet. That's a long-term objective," Dyster said. But it's going to be a noticeable and positive difference and I think that with the combined improvements that have been made in the operation of the plant and the capital investments that are being made - knock on wood - I don't think we are ever going to have another black water incident." Dyster said state payment of half the cost is a break for the city. "Although we haven't had a repeat of the 'black water' discharge since that occurrence, I think all of us understand that there are major improvements that have to be made, phase by phase, at Niagara Falls Wastewater Treatment Plant in order to not just prevent a repeat of the black water incident, but to reduce the number of combined sewer overflows and eliminate odor problems," he said. Dyster said while the work will certainly improve the city's image to tourists, it will also make the city a little better place to live for residents and provide a lot of jobs for the construction workers involved. Niagara Falls, N.Y., has a messy problem -- it continues to dump sewage and discolored water downriver from the popular tourist attraction. The most recent incident happened Wednesday afternoon. The City of Niagara Falls has made news in recent months for the problems plaguing its water infrastructure. But the Cataract City is just one of many municipalities dealing with outdated systems in states of disrepair. 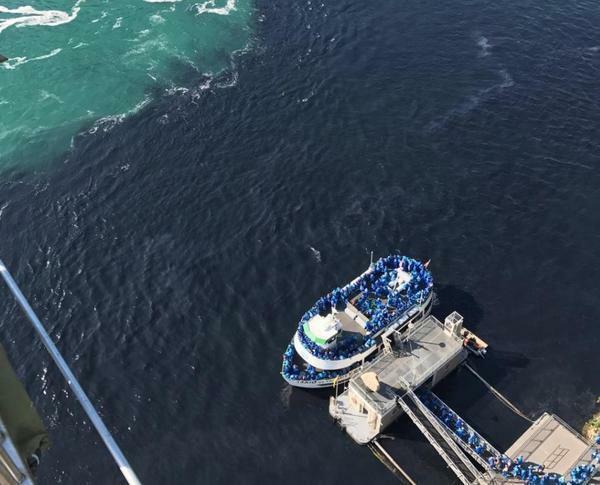 The Niagara Falls Water Board is launching a new initiative to raise awareness of the need for large-scale improvements not just in that city but across the Great Lakes region.